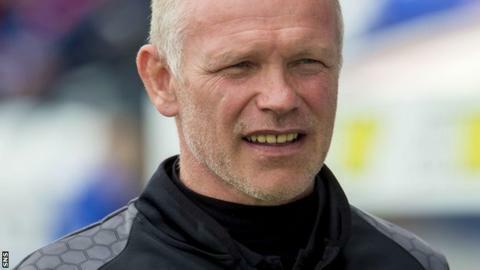 John Hughes says he is happy at Inverness CT despite being "flattered" by links to managerial vacancies. Motherwell and Dundee United have begun the recruitment process after parting company with Ian Baraclough and Jackie McNamara, respectively. Hughes, who won the Scottish Cup last season, told BBC Scotland he is satisfied in the Highlands. "Honestly, I absolutely love it up here," he said. "There's not a better place in Scotland to be; it's unique." Hughes was PFA Scotland's manager of the year last season following Caley Thistle's first Scottish Cup triumph and steering the club to a third place finish in the Premiership. "The board of directors let you get on with it; we've had great success and I'm still trying to really work hard to get success," he explained. "Being linked to other jobs is flattering but I'm happy where I am." The Inverness CT boss said he enjoyed a good rapport with his squad and a happy dressing room. "That's what I get at Inverness," he added. "It's flattering to be linked with other jobs but I'm really focused on Inverness and trying to pick up three points on Saturday [in the Highland derby]."